emacs-shellfm is a tiny package designed to provide Emacs interface to Shell-FM console player. You may also download a snapshot tarball. See also project page on Ohloh. Loving/unloving, skipping, pausing playback, banning current track/artist, querying for track info etc. Installation notes and usage tips are in README file (an OrgMode one actually) in emacs-shellfm source. 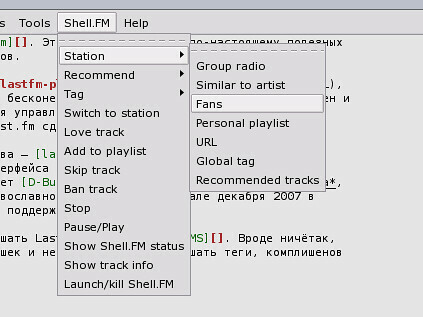 Emacs-shellfm needs Shell-FM version 0.7 or later.